What if we could turn back the clock and prevent milfoil from entering Lake Minnetonka? Knowing what a problem it has caused, wouldn't we have taken the necessary steps? We are now faced with something equally as harmful and troublesome. Zebra mussels, if they get into Lake Minnetonka, would be a disaster. Zebra mussel would do lots of damage – to the economy, to recreation, to lake health, to the fishery – and once in the lake, there is no remedy. So, we must put all our eggs in the prevention basket. But this is not happening – at least not to an adequate degree. There are inspectors at some accesses at some times, there are automatic video devices and the state has a broad education campaign. But these are not enough and Lake Minnetonka remains highly exposed. The problem is this – we are not set up for funding or even approaching the prevention of zebra mussel (and soon many other nasty exotic plants and animals) due to archaic policy framework that encourages unfettered access to our public waters. These policies were developed at times when aquatic invasive species were not an issue, but they sure are now. We cannot solve this problem within the same framework that created it. We must have new thinking to have a real chance at preventing zebra mussels from getting into Lake Minnetonka. The Lake Minnetonka Association believes that prevention of zebra mussels must come from two levels. There must be a comprehensive state-wide imperative to keep zebra mussels from moving around. This should involve more aggressive enforcement and containment – neither of which are occurring now. There must also be a comprehensive protection plan for Lake Minnetonka. Right now, the level of inspectors and automatic monitoring devices covers some accesses at peak times, but we remain highly exposed. Thousands of boats bypass these measures. As well, no boats at special events are inspected, and many of these come from out of state. More inspectors or more monitors are not feasible because there are too many access points on Lake Minnetonka. The Lake Minnetonka Association has developed a plan that proposes closing some accesses at some times to facilitate inspections. We have also proposed fees for boaters to offset the costs of protecting our lake. We believe that these are fair and appropriate for addressing the problem and can (and should) be done in a way to assure access to the lake. We believe the Cities, through the LMCD, have a responsibility to provide resources to protect the lake. To their credit, the LMCD has provided some protection by stretching their budget. Unfortunately, as I write this, neither the Cities nor the LMCD appear willing to provide the needed funds. We applauded LMCD Chair Tom Skramstad’s leadership when he challenged the LMCD to increase funding for protecting the lake when preparing their 2008 budget. Unfortunately, no increase has been proposed. To make matters worse, the LMCD discussed perhaps developing a budget in 2008 to develop a plan in 2009. We do not need another plan – we need action, leadership and new thinking. We need those who live on and use the lake to demand the agencies charged with protecting our lake to make that a priority. 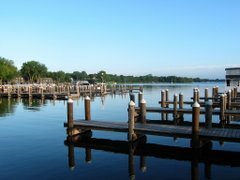 The Lake Minnetonka Association believes Lake Minnetonka is a public resource for all to use and enjoy. Unfortunately, aquatic invasive species have changed the game. Meaningful and effective protection measures will require additional cost and inconvenience. We know that some access closures or the imposition of fees are controversial. We are open to other ideas for the protection of Lake Minnetonka, but we think what we have proposed must be on the table if we are serious about keeping zebra mussels out of the lake. If we continue to approach this issue by just doing what we can rather than what needs to be done, we are not taking this seriously and we will soon have zebra mussels. We do not want that.